The Braud 9000 series is powered by ultra-efficient FPT Industrial 6-cylinder Tier III common rail electronic engines providing 175 horsepower. Combined with the Anti-Skid Twin Lock transmission and IMS 2.0, the power management is designed for efficient fuel consumption. FPT Industrial NEF engines require no EGR valve solution, as the engine only breathes fresh, clean air. As a result, engine power outputs are equivalent to higher horsepower competitors that use EGR valves. The machine with the best engine on the market is the obvious choice. 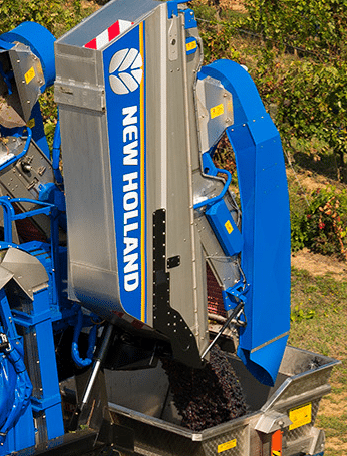 With industry-exclusive features such as the Noria collection system, and the SDC shaking system, Braud 9000 Series grape harvesters preserve the quality of your grapes for top-quality wines. 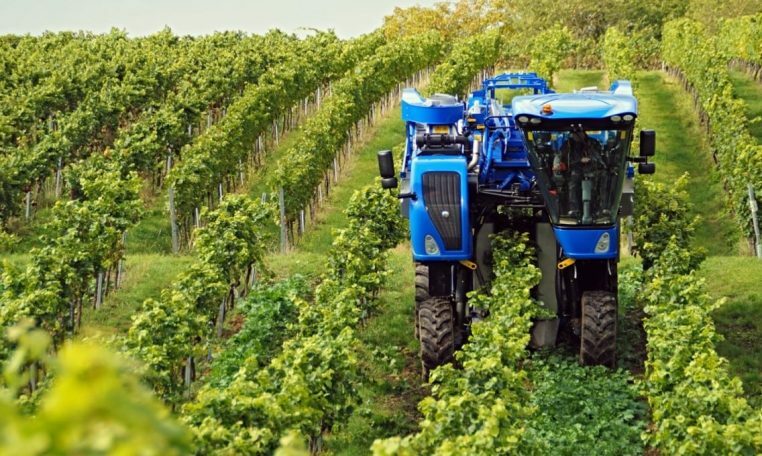 These high-capacity models are designed to be gentle on the vines, provide better climbing capability in steep hills, and be more efficient and easy to operate. Industry-leading cleaning systems, such as Opti-Grape™ and the patented SOCMA destemmer means your operation benefits from less time cleaning at the winery and better tasting wines. Optimizing productivity for all vine types has never been easier. 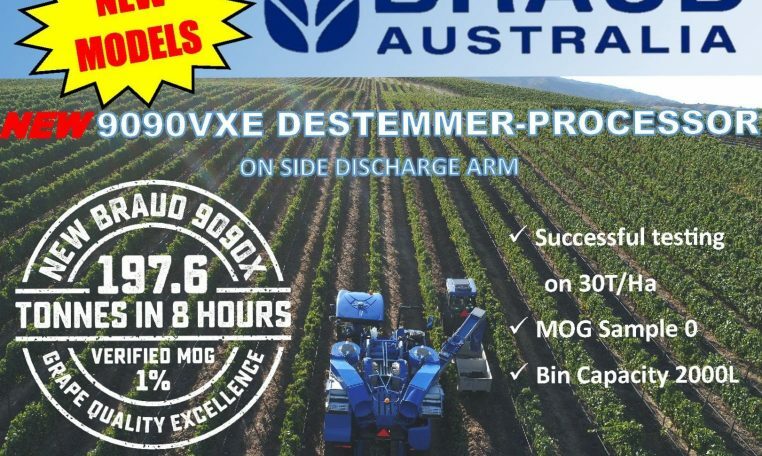 It’s quick to set up the Braud 9000 Series to work in different vineyards for maximum efficiency. 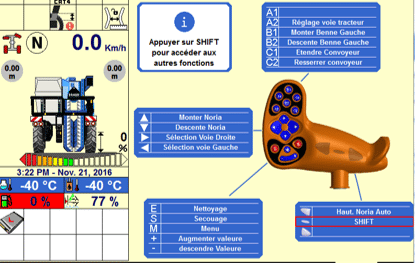 The integrated Intelligent Management System 2.0, with IntelliView™ IV touchscreen monitor provides full access to all key harvester functions. The Automated Crop Setup (ACS) feature helps you program and store your preferred harvesting settings for easy setup to start your harvest. The washing process has been reinvented. The Braud 9000 Series now features wireless remote-control convenience to provide effective washing while saving you time and money. 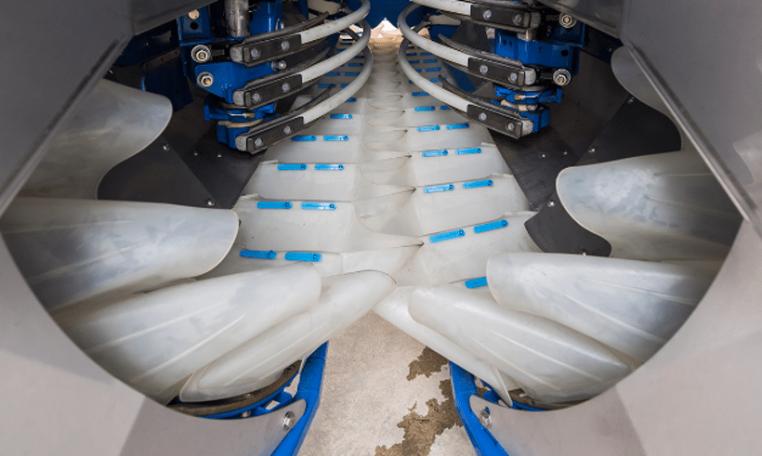 A unique pre-washing system reduces picking head wash time with a strategically positioned water supply pipe, water nozzles positioned to key areas, and fewer debris accumulation areas. The innovative 9090X side-arm conveyor allows you to harvest and unload on the go, acre after acre. Now available with the side conveyor 9090X: the optional SOCMA patented destemmer. 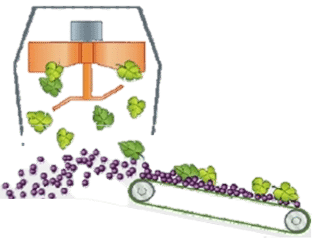 An advanced mesh and finger system eliminates 99.56% of harvest impurities, or MOG (material other than grapes) including rachis, stalks, leaves other debris. 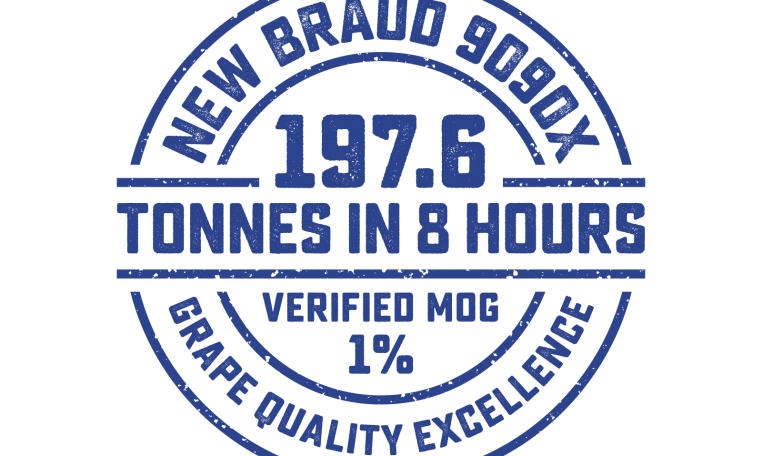 By removing MOG while you harvest, you not only improve your efficiency, you help eliminate the herbaceous taste that can be transferred to the grapes during transport to the winery. If you prefer, choose twin hoppers with a full 1056-gallon (4,000L) capacity. The 10.5-foot tilting height provides plenty of clearance to unload into gondolas of varying heights. Plus, you can unload the hoppers simultaneously to reduce downtime. This model features a pre-sorting system for even better cleaning capacity. Two rollers positioned at the end of the receiving conveyors direct single berries that don’t need destemming directly onto the cross conveyor to increase air flow. 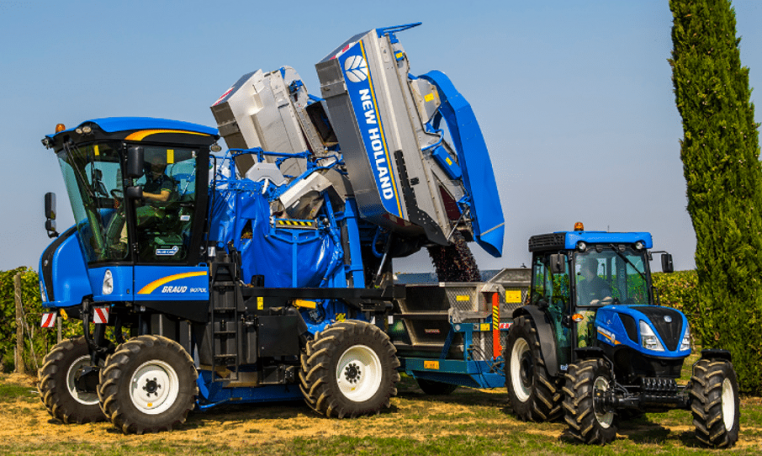 For the two-hopper 9090X model, the optional destemmer is fitted on the top of each hopper and does not compromise hopper capacity for optimum productivity. model. Blue Cab™ 4 technology combines a cab filtration system with complete comfort. It is intended for multi-function activities such as spraying, or for those who expect the most operating ease with unique features. A heated and air ventilated two-tone seat ensures you stay relaxed and productive all day or night long. 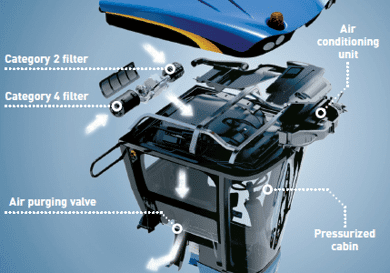 The Blue Cab 4 system is the most advanced cab filtration system on the market. 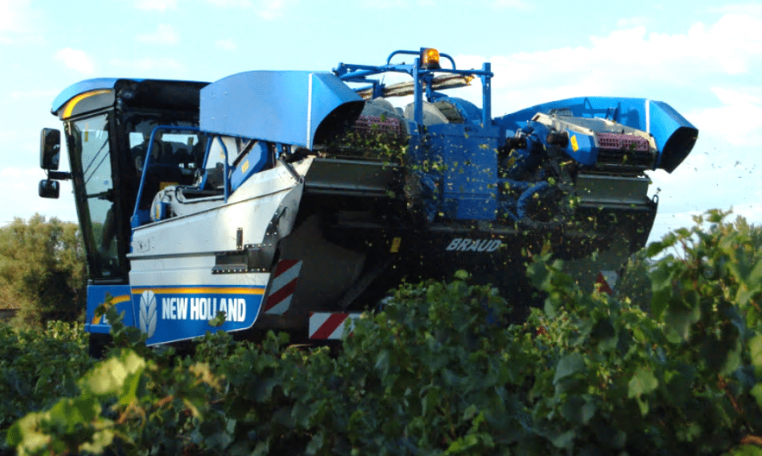 The Braud machine has been designed to be used all year long, from pre-pruning to grape harvesting. A patented system to couple and uncouple the picking head and a front tool carrier provide the flexibility vineyards desire. 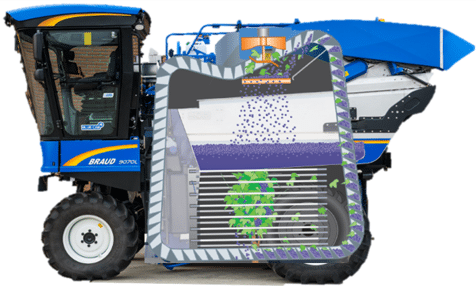 Multi-function on demand software provides extra adaptability, allowing control of any implement through the multi-function handle and IntelliView™ IV screen.